8 July 2008, at 9:45a.m. 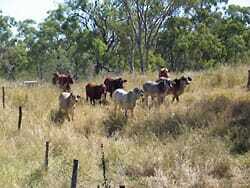 AUSTRALIA - CSIRO research underway in Central Queensland’s cattle country is investigating whether the integration of trees, pasture and livestock into a single agricultural system will produce greater net returns for producers and the environment. The ‘silvopastoralism’ system is gaining worldwide attention as a potentially profitable land-use practice, particularly following the emergence of new market opportunities such as carbon trading. CSIRO Livestock Industries’ (CLI) project leader and resource economist, Mick Stephens, says that since the 1960s a significant proportion of trees have been removed from the open woodland zones in northern Australia to support the pastoral and cropping industries. Project team members (L-R): Steven Bray (Qld DPI&F), Mick Stephens and Sam Williams (CSIRO), Anne Stunzner (CQFA) adjacent to an open woodland grazing paddock at CSIRO's JM Rendel Laboratory, Rockhampton. The project will utilize earlier research by the Queensland Department of Natural Resources and Water into some of the competitive and stimulatory effects of wide rows of trees on pasture production. The designs being evaluated include planting well-spaced rows of high-yield eucalypt trees – and 20 to 100m wide rows of native woodland regrowth trees – on pasture lands. Modelling techniques will be employed at a farm level to assess the sensitivity of silvopastoral systems to current and projected cost, price and yield scenarios and help identify under what circumstances these systems are likely to be a profitable land use.